To view the location of Dessau in relation to northeast Austin today, see Historical Diagram of Copperfield - Area Sites. The town of Dessau Has been swallowed up by Austin's urban sprawl. The main remaining landmark is the Dessau Hall dancehall building at the intersection of Dessau and Howard, which played host to such notables as Elvis Presley and Bob Wills. Well, our first recording session was about a big dance hall we played every Saturday night near Austin called Dessau Hall. One of the boys in the band, Horace Barnett, wrote a song called "The Dessau Hall Waltz" and we made a demonstration dub of it and Dessau Hall had a radio program every afternoon for about fifteen minutes advertising their dances and they started playing it on there and the response was so great that a recording company called Lasso Records contacted us, and also Republic Records out of New York, and wanted to buy the master of it. We didn't have a master so we cut them a master and that was our first recordings, and that did so well from there we went to Imperial Records. 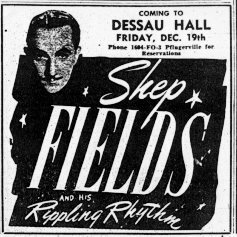 An article regarding Dessau Hall (the dancehall at Dessau at Howard) in the Austin Chronicle (http://www.austinchronicle.com/issues/vol17/issue33/music.dessau.html) states "And an up-and-coming rock-&-roll star by the name of Elvis Presley is reported to have played the hall twice: The first time, possibly in 1956, there was no one there; when he came back a year later you couldn't get a ticket." A record company by the name of Krazy Kat has a CD called Texas Dancehall Music which has on it a song called "Dessau Hall" See Wanderers Swing-Texas Dance Hall Music. The following information on Dessau, Texas, is from the Texas State Historical Association. DESSAU, TEXAS. Dessau, named for a town in Germany, is eleven miles northeast of Austin and two miles southwest of Pflugerville in northeastern Travis County. A post office was in operation there from 1886 to 1890 and from 1897 to 1901, at which time service was discontinued and mail rerouted to Austin. Dessau had a one-teacher school with forty students in 1907; the school was consolidated with the Pflugerville district in 1920. The population of Dessau was estimated at thirty in the late 1890s. It fell to ten by the early 1930s but by the late 1940s had risen to fifty, where it remained through the mid-1960s, after which population estimates were not available. Dessau was still listed as a community in 1990. "DESSAU, TX." The Handbook of Texas Online. [Accessed Sat Nov 4 12:08:46 US/Central 2000 ]. Question 1 Are there any available records that refer to this event? Can you find someone in the Austin area today who can testify of this event? Note: Contact the author of the article, Jay Hardwig, at the Austin Chronicle. Also, consult the numerous histories of Elvis that are in the library. It seems to be well known that Elvis played at the Skyline Club on October 6, 1955 (see this list of known Elvis concerts). The Skyline Club is a local historical item (see Copperfield History Overview). Question 2 Can you obtain recordings of the song(s) related to Dessau Hall and/or recordings of the daily radio program mentioned by Jimmie Heap? If so, can you create a web page from which the recordings may be listened to? Question 3 Can you find further records on the history of Dessau Hall? Has there ever been a Dessau newspaper? If so, try to locate the archives. Tell the general history of Dessau Hall or of the community in which it is located. Question 4 Can you create a web page with a collection of photos, newspaper articles, and personal accounts related to Dessau Hall?